I admire anyone who can doodle(I cannot for the life of me...) especially like this! Beautiful. oh those are some pretty doodles!!!! Happy PPF!!!! I am a fan of Nora's and really love her great work. She doodles with a lot of class. Way to go Nora. Congrats Happy Paint Party Friday to all. Thank you Eva and Kristin. I love Nora's Flower doodles. Blessings! This flower doodle is so beautiful. Great work Nora!! Oh I love the colors Nora! So many details, super fab. ;) Happy PPF!! And love Nora's works! They are so colorful and unique!! Nora's beautiful colourful art is something to make you smile. Gorgeous details, colours and design. Love the intricate work! Such lovely dreamy colours, and a wonderful page of doodles. Just loved Nora's flower doodles. Thanks again for hosting. Am always fascinated by people who can doodle. Have a wonderful weekend everyone and a Happy PPF to Eva and Kristin and you all. Congrats to Nora. Those flower patterns have been mesmerizing. Wow Nora's work is just beautiful! Those doodles are georgeous. I shall definitely be lookig for Nora's name in future linky lists. Beautiful doodles! Thanks for hosting. Nora's work is beautiful - so detailed and delicate and slightly surreal! It's fantastic so many folk link up now - I only wish I had time to get round them all but if I did I'd never have time left for painting! Thank you so much for faithfully hosting us and I love the flower doodles--really cool! I love Nora's intricate doodles. I feel like I could get lost in there! Thank you for hosting this wonderful blog. It gives artists and viewers alike a place to go to see a variety of wonderful art pieces. i love Noras color divisions and doodles over the top. So fun and fancy! Thank you very much!! I had no idea I was feature here. Have a great day and thank you for the great job you do here, for all of us to enjoy!! Made it by the skin of my teeth - who has skin on their teeth? Thanks Eva and Kristin for hosting this wonderful event. 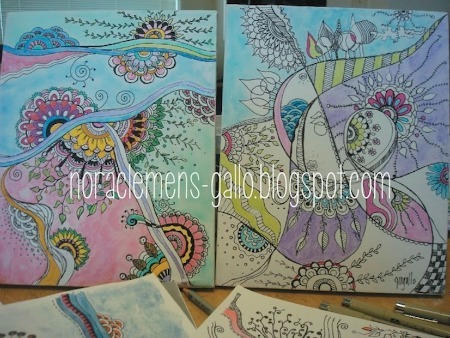 I just adore Noras gorgeous work....I keep saying these patterns should be on quilts....or at spoonflower on material!! Nora's art is magical..exquisite beauty and visually stunning always!